Being an engaging leader and having an engaged team is great but you must get the important things done whether you or your team feel like it. Whether you run your own business or work for someone else, you’ve probably got a lot on your plate. Along with the portion of your work that you feel like doing often comes a generous helping of things you’d rather not do. With many businesses failing due to not getting some of the important intentions that were necessary for it to thrive DONE then we can help give attention and support to this important area. 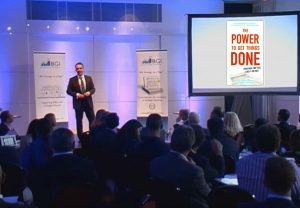 We provide masterclasses and keynotes based around the concepts of ‘The Power To Get Things Done – Whether You Feel Like It Or Not’ which Chris co-authored with Dr Steven Levinson and was published by Penguin Random House New York. We also provide bespoke team development events in the UK with our partner Carnegie Great Outdoors (Leeds Beckett University) which includes integrating the principles of getting things done with a whole host of fun, engaging, rewarding and challenging team games and outdoor activities. We also provide ongoing accountability and non executive style support as well as sometimes delivering important elevatory projects for our clients. During this workshop or speech Chris will share with you how to consistently turn good intentions into action so that you can be as successful as possible in the work you do….whether or not you feel like filing tax forms, making follow-up calls or taking action on a myriad of different intentions. The Power To Get Things Done has been designed to help leaders and managers to get those things that impact the performance of their organization DONE (whether they feel like it or not). The event is based upon the book ‘The Power To Get Things Done (Whether You Feel Like It Or Not) published by Penguin Random House and involves co-author and Business Elevation expert Chris Cooper working in partnership with Carnegie Great Outdoors team. The 2-day (or 3 day) residential programme is aimed at individuals and teams who need to follow through with key initiatives. Through a mix of indoor and outdoor activities, group discussion in the classroom, self assessment and reflection; Individuals will become more knowledgeable and confident about what they need to get done, what they may need to overcome and the strategies to do so. Also, delegates with teams will think through how they can help others to get things done. The key principles can be shared in one day, however, a two day programme gives more time to come together as a team and leave on the front foot. A 3 day programme would include profiling and additional activities so that people have a map to understand the types of tasks they may naturally avoid and further strategies to overcome them. Leave with greater clarity around your core intentions and priorities for yourself and your team (if you have one) for the next 12 months. Stop blaming yourself or your team for not getting the important things done – instead get more done as you know the process. Understand the essential manual strategies that you will apply to ensure that the essential things get done. Apply strategies against each of your core intentions to ensure you (and if you have a team) follow through. The programme can be provided in a range of accomodation including Youth Hostels, Country Hotels and Castles and Country Estates. Chris Cooper has acted as a trusted project manager, coach and interviewer across a range of videos and audio aimed at elevating client business in the eyes of their stakeholders. SSP and Keychoice wanted to help their clients to understand their proposition better. It was decided to create a series of 15 videos to help articulate the proposition. Chris provided the project management, structure, interviewing and coaching support for the project. Also, content from our radio show was used to supplement learning for a client base of 1200 insurance brokers. If you are looking for a Trusted Advisor for your board, are based in the UK and are seeking someone with breadth, a strong track record and a bias towards people then let’s have a chat. Chris Cooper and John Jennings provide a number of organisations with senior level support.